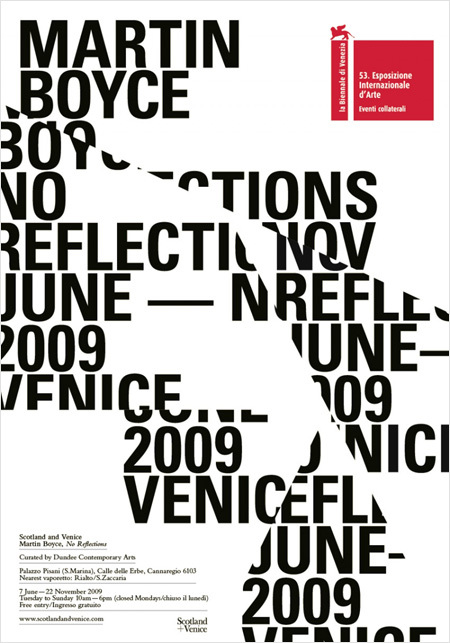 This poster by Glasgow studio Graphical House was created to promote Scottish artist Martin Boyce’s installment entitled “No Reflections”, at La Biennale di Venezia in 2009. The poster is printed on 308gsm Hahnemuhle Photorag paper with Ultra Chrome K3 digital inks. It’s limited to only 20 prints, and you can grab one at Graphical House’s shop. Also check out the complete identity they did for the project. I love the logotype and the use of Baskerville. 1 Comment on "Graphical House"